Fender Deluxe 5E3 Model Tube Amplifier (1960), made in Fullerton, California, serial # D-09782, tweed fabric covering finish. Height is 15 3/4 in. (40 cm. ), 20 in. (50.8 cm.) width, and 9 1/2 in. (24.1 cm.) deep. 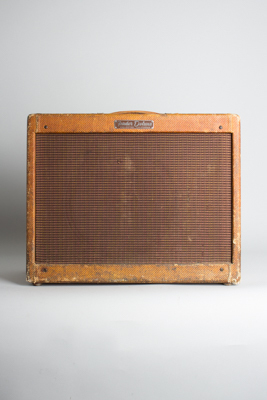 This amp is a true relic, heavily gig-worn on the outside but true to its original form, producing one of the sweetest sounds known to man when cranked. Externally the tweed is darkened, stained, scuffed, and covered on the top with cigarette burns (remember when practically everybody smoked -- especially guitar players?). It still remains more original than many on the inside, with period (possible original) tubes, the original Jensen speaker (reconed), and an added 3-prong plug. The filter caps are all Sprague Atoms, but the bulk of the other components are still original. A tone monster, and a fine example of why these later narrow-panel Deluxes are held in such high regard. Very Good + Condition.